(Associated Press photo) Lynda Carter, star of the television series "Wonder Woman," signs autographs following a ceremony honoring her with a star on the Hollywood Walk of Fame on Tuesday, April 3, 2018, in Los Angeles. Carter has joined the lineup of celebrities coming to FanX Salt Lake Comic Convention, April 19-20, 2019. TV’s original Amazon princess and the king of shock rock are coming to FanX. Lynda Carter, who starred as the Amazonian superheroine in the 1970s “Wonder Woman” TV series, and rock star Alice Cooper have joined the lineup for FanX Salt Lake Comic Convention, set for April 19-20 at the Salt Palace Convention Center. “It’s very exciting. She rarely does these kind of appearances,” Bryan Brandenburg, FanX’s co-founder, said of Carter. Carter will not only talk on a panel, but perform in concert on Friday night, April 19. There also will be a limited meet-and-greet opportunity, Brandenburg said. Cooper will not be performing a concert during his appearance at FanX, but will do a panel where he’ll talk and answer questions. “There is a portion of our current fan base, and some people who would never come, who would want to see him,” Brandenburg said. Ticket sales for this year’s spring FanX are keeping up with sales for spring 2017, the last year FanX held two events in the same year, Brandenburg said. More guests will be announced, which should put this year’s numbers ahead of 2017, he said. Passes and tickets for FanX are available at fanxsaltlake.com. Carter, 67, represented the United States in the 1972 Miss World pageant, and made guest appearances in a few TV shows in the mid-1970s. Her star-making moment came in 1975, when she was cast in “Wonder Woman,” the TV adaptation of the DC Comics superheroine, Princess Diana aka Diana Prince, come to America. The series was set during World War II during its first season, on ABC. It switched networks, to CBS, and settings — to modern times, the late 1970s — for the show’s second and third seasons. Since her “Wonder Woman” heyday, Carter has occasionally appeared as authority figures. She played Gov. Jessman in the 2001 comedy “Super Troopers” and its 2018 sequel. In the 2005 Disney comedy “Sky High,” she played Principal Powers, the person in charge of the superhero high school. Most recently, she had a recurring role on The CW’s “Supergirl,” as Olivia Marsdin, who had to resign as president of the United States when it was revealed she was a shape-shifting alien. 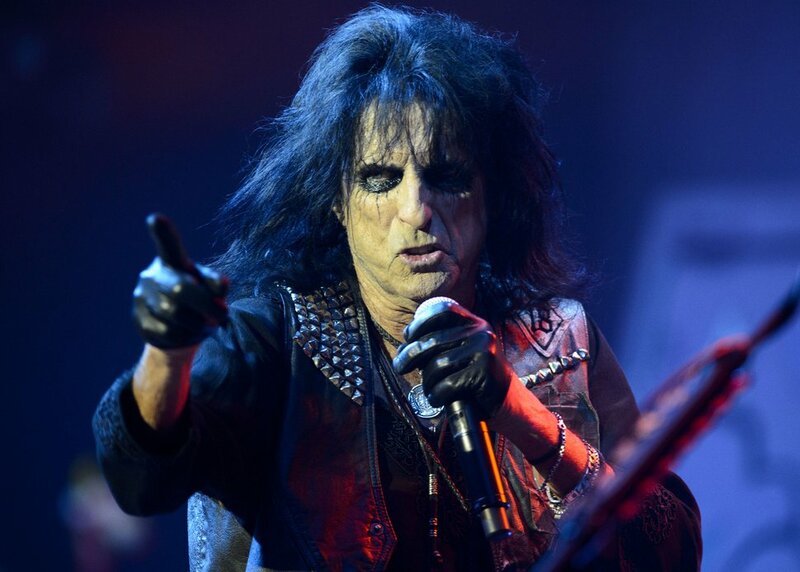 (The Salt Lake Tribune file photo) Rock legend Alice Cooper, seen here in concert in Salt Lake City, will join the celebrity lineup at FanX Salt Lake Comic Convention, set for April 19-20, 2019.
Cooper, 71, has been performing his theatrical brand of rock ’n’ roll for more than 50 years, deploying such shock-provoking props as guillotines, electric chairs, fake blood and real snakes. He and the original Alice Cooper band were inducted into the Rock and Roll Hall of Fame in 2011, in recognition of his influence on the hard rock, metal, glam and industrial genres. On Monday, it was announced Cooper would co-headline a 19-city tour with Halestorm this July and August, but no stops west of Texas have been set.